Can cooling explain why ‘miracle’ baby survived? A premature baby - who was declared dead shortly after birth - was later discovered to be alive after spending 10 hours in a morgue refrigerator. How did this happen? Doctors at the Perrando Hospital in northeast Argentina can’t explain how several doctors pronounced the child dead or how the premature infant born three months early survived for so many hours inside a chilly coffin. The baby, Luz Milagros Veron, was reported Friday in "very serious" condition after doctors detected an infection. A similar case occurred in Israel in 2008. A baby was found alive in a morgue refrigerator after having been declared dead for five hours, according to the Jerusalem Post. 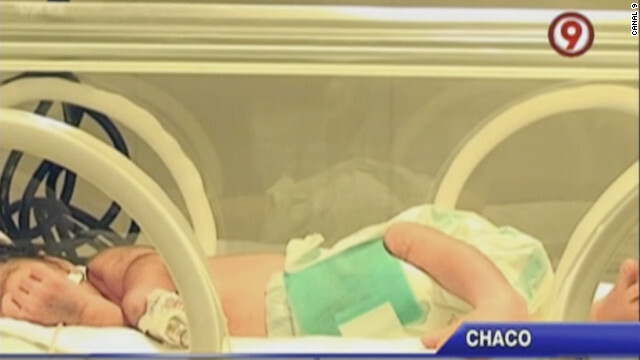 An Israeli doctor suggested the premature infant's irregular heartbeat could've eluded doctors and that placing the child in the cooler kept her in "suspended animation." The baby later died. In a case last year, a 60-year-old man woke up in a South African morgue after 21 hours. Could the cold temperature help people in these circumstances survive? After all, the practice of lowering a patient’s body temperature - called therapeutic hypothermia - helps heart attack patients and infants survive. For decades, evidence showed that therapeutic hypothermia can improve the odds of heart patients. No one quite knows why, but it's thought that the cold reduces the body's need for oxygen and slows the deadly chemical cascade that sets in when oxygen isn't circulating because the heart stopped beating. The cooling can reduce the amount of oxygen needed, and slow the heart rate and basal metabolic rate. “One of the hypothesis is that you could slow down the programmed cell death and reinstitute the oxygen and glucose,” said Dr. Jim Greenberg, co-director of the Perinatal Institute at Cincinnati Children’s Hospital Medical Center. The therapy for babies are for those who have hypoxic–ischemic encephalopathy, in which they suffer a lack of oxygen and blood supply to the brain. But this practice is not used in very tiny premature babies, D’Netto said. Luz was born three months premature and weighed a mere 1 pound and 12 ounces. In this therapy, the babies’ temperatures are lowered by using a cooling blanket for three days in a controlled environment. The cooling can help babies preserve brain function as their body temperatures lower from 98.6 degrees to 92 degrees Fahrenheit. A morgue refrigerator would be far colder, around 40 degrees, said Greenberg. A baby of Luz's size would most likely not survive 10 hours inside frigid temperatures. Greenburg has seen cases of newborns birthed into toilets or cold environments who have survived - although they were exposed for hours and came to the hospital with body temperatures in the 80s. CNN readers asserted that Luz’s survival can only be explained as a miracle. “Why is it so hard for so many of us to 'believe" in miracles ... just look at the stars on a clear night ... millions of them zillions of miles away!! We are part of this miraculous universe! The cells in our bodies, miracles ... we don't always have to have an explanation,” wrote a commenter named JW8686. Another commenter - Coriolana Magna - disagreed. First, whether it be submersion injuries or ventricular arrhythmias, or neonatal hypoxic ischemic encephalopathy, the therapuetic hypothermia has been showed to improve survival and decrease disability (which is actually more important than survival) but only within a limited time frame. Not 10 hours. Second, survival does not mean the child will be healthy or neurological normal. Someone can survive in a persistent vegetative state. I don't think many people would think of a neurologically devastated child as a "miracle", though some might. The bottom line is that by some stroke of luck (and some hypothermia) this child survived. If she is able to survive it without having severe neurological injury, that would be a miracle. The next time I read a weblog, I hope that it doesnt disappoint me as much as this one. I mean, I do know it was my choice to read, however I truly thought youd have one thing fascinating to say. All I hear is a bunch of whining about one thing that you may repair if you happen to werent too busy in search of attention. I do not even know how I ended up here, but I thought this publish was good. I do not understand who you're but definitely you're going to a famous blogger in case you are not already 😉 Cheers! Certainly no miracles. Hypothermia does help reduce need of oxygen by cells especially brain cells. In the 50's it was usual for Anaesthetists to reduce body temperaturs which complimented hypotensive anaesthesia for neurosurgical procedures.